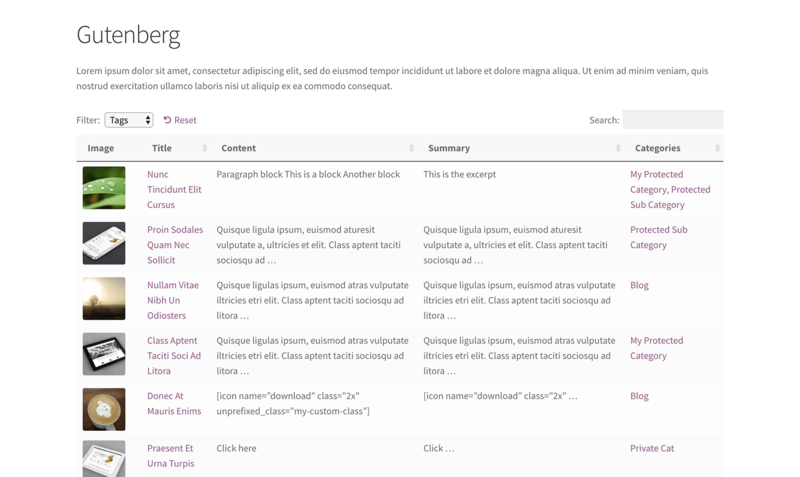 The shortcodes option allows your table to display content generated by any shortcodes used on your site, or page layout builders such as Gutenberg. It also tells the table to render any HTML or other formatting from your posts, instead of displaying it as plain text. WordPress provides several built-in shortcodes for displaying audio files, videos, media playlists and image galleries. You can display these embedded media files directly in a table. Your theme or another plugin might provide shortcodes to add buttons, icons or other styles. You can include these in a table. You might want text formatting such as bold, paragraph breaks or hyperlinks to appear in the table, instead of having this stripped out. Document library with button & icon shortcodes. Table with audio and video shortcodes. 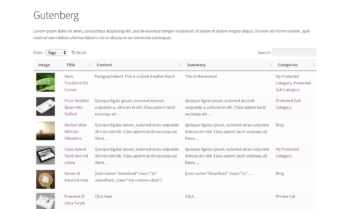 Why don’t my shortcodes or Gutenberg layouts display in the table? Processing shortcode content can take a significant amount of time – especially for large tables – so enabling them can have a performance impact on your site. Shortcodes often add HTML to the content which makes it difficult to limit content to a set number of words (see content_length and excerpt_length). For this reason, if you enable shortcodes, then the full content is always displayed and the content_length option is ignored. The same happens if you have used the Gutenberg editor to create the content of the posts that you are displaying in the table. You can display shortcodes and other formatting in the table by adding shortcodes="true" to the Posts Table Pro shortcode. Once you’ve done this, you can add shortcodes to any of the columns supported by Posts Table Pro. 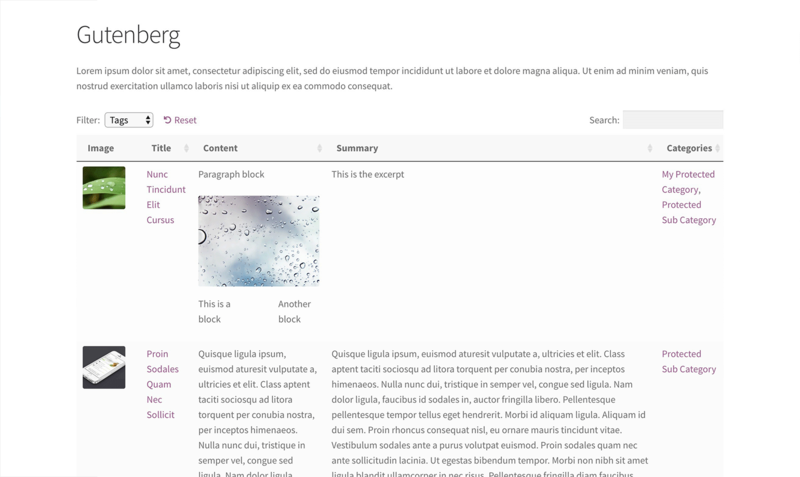 If you've used Gutenberg for your post contents, then the 'content' column of our Posts Table Pro plugin can display the correct layout for your Gutenberg blocks.